The king of DH / race pedals. mallet pedals feature a double sided open design allowing for quick and reliable engagement with minimal mud clogging. A two piece body keeps the weight down whilst providing a strong and durable platform. 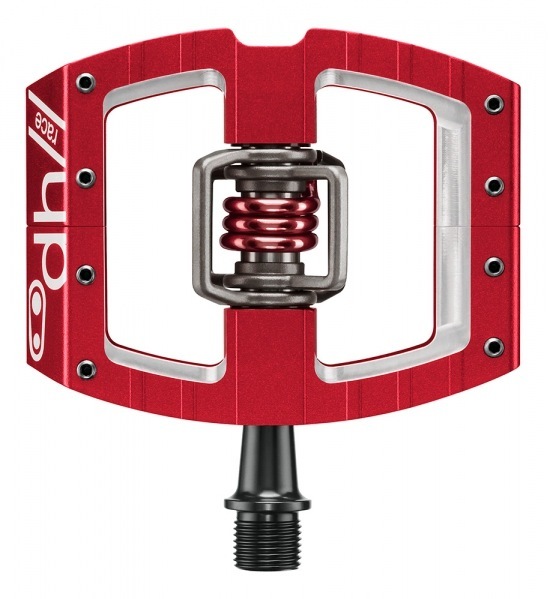 mallet DH are the clipless pedal of choice by most Pro World Cup riders. The ability to set the release angle of the cleats to either 15° to 20° means you can be really active on the pedal whilst still remaining attached to the bike. The concave pedal body gives a flat pedal feel with the assurance that you are connected to the bike. Release angle: 15° to 20° Cleat: Premium brass cleats included Warranty: 5 years Weight: 479g per pair Platform: Extruded/machined aluminium Wings: Investment cast steel Spring: 300 series spring steel Spindle: Forged scm435 chromoly steel Inner bearing: igus LL-glide bearing has been exclusively formulated for crankbrothers. It performs in even the most adverse conditions out on the trails. Outer bearing: enduro cartridge bearing is designed specifically for pedals. Enduro use superior materials, grease and sealing on their bearings which are designed especially for use on a bike. Double seal system combines a double lip internal seal and a new external seal to keep water and debris from entering the pedal. Traction pins: 8mm adjustable Colour: Red or Black Excellent mud-shedding: using the very open designed pedal platform. Ribbed body for extra traction when unclipped 4-sided entry: clip in on all 4 sides of the pedal, by pushing forward or pulling backwards on the pedal. Extremely lightweight: pedal design is very simple with only a few key parts. Increased float: 6° of side-to-side rotational play. The float of the pedal allows for the rider to shift positions on the bike, while keeping their feet clipped into the pedal. This allows for improved rider control and bike handling. Fit adjustment: crankbrothers premium cleats can be adjusted for either 15° or 20° release angle. Zero-float cleats can be purchased separately. crankbrothers pedals are fully re-buildable for simple maintenance. There is a consistency in parts across all pedal models, which allows for ease of servicing, this is easily done using the pedal refresh kit (CRB-16051). Servicing is simple and does not require any specialist tools, just a flat head screwdriver, socket wrench and 8mm allen key to hold the pedal by the axle.